How do Serial #’s work? And need help identifying items. Hi there! 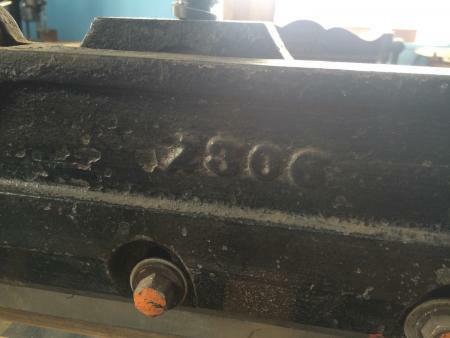 I’m trying to identify some letterpress equipment and date it. I found the serial #s on most of the items, but I’m not actually sure how to utilize the serial numbers. I’d also like to know how this machine works/what it does. I’ve never come across anything like it before. Couldn’t find a clear serial # on this one and was hoping for help on where to look for the #? 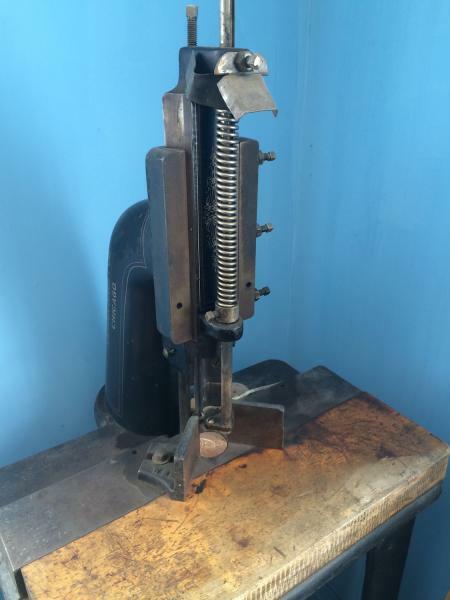 It must be an older piece because the system does not require both hands on it in order to cut. I also posted 2 photos below that I thought could possibly be the serial #’s. 5.) 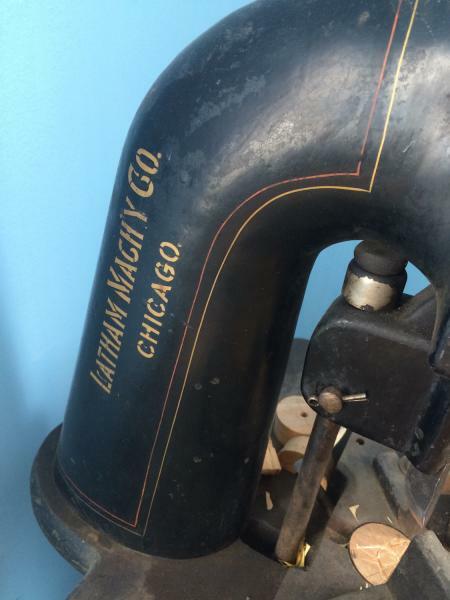 Also there is a corner-rounder cutter Latham Machy Co Chicago (pictured below) that I would like to get a serial # off of or get more information about. 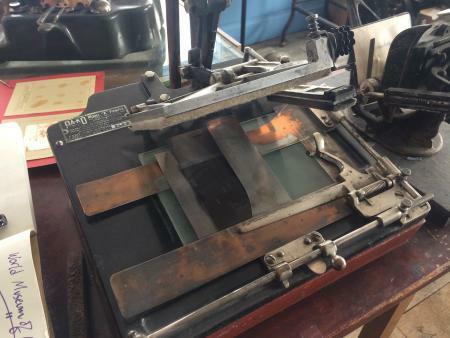 Possible Serial Number of C and P paper cutter? Close up of the corner chopper. Serial numeration varies by company. 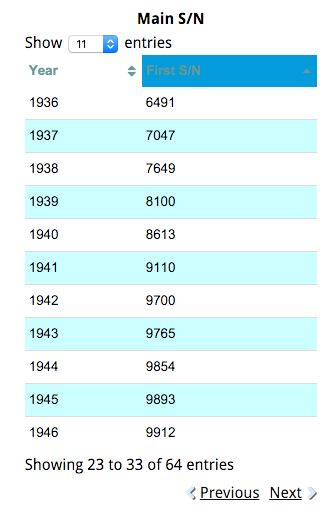 As an example: Vandercook serial numbers are absolutely sequential by year, regardless of model, whereas C&P serial numbers are sequential by model within a given year. 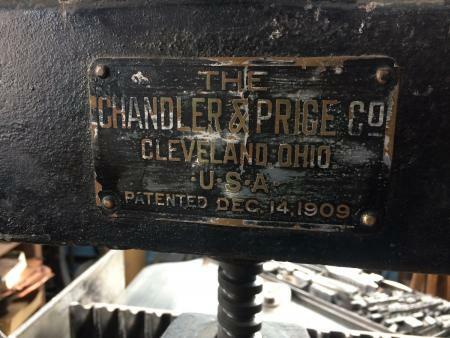 This is documentable since lists of Vandercook and C&P serial numbers are available on line. I confess I don’t know about other companies methods of numeration. Thank you Bill, I take that to mean that the No. 1 Vandercook is dated to 1937 then? According to their website, the serial # (7419) falls between 1937 and 1938 that this makes it a ‘37. I hope that is the correct logic. Serial # is 7419 so the press is from 1937. 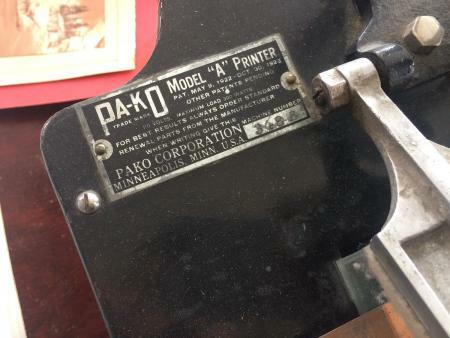 The Pako printer is actually a photographic contact printer. The photographic negative would be held in contact with a photosensitized sheet of paper, exposed from a light within the box, and then processed with photo chemistry to reveal the image created. The mechanism on the top of the box is designed to mask off borders for the prints. I believe your logic is correct on the serial number list for Vandercook. If serial number lists are not found for the other equipment, perhaps someone could look a distributors’ catalogs and see when the item first appeared in this form. That would give you a date, but not necessarily the earliest date for the item. 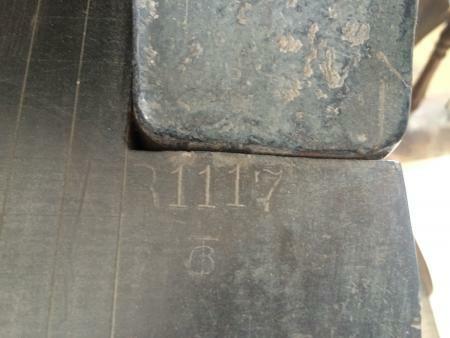 Looks like the serial number for the C&P cutter is dates it to 1915. I have the serial number chart posted here. Thank you John, Paul and Justin! Paul, I will send you the owner and the location of the No. 1 Vandercook soon. Challenge Mchy. Co Gravity Press and the Corner Rounder (there must be a better name than what I’m calling that machine…). Hope someone else sees this and can help.